Laughlin Mill in Cumberland County, PA.
"O For Grace to Trust Him More"
In light of the recent martyrdoms that took place in Afghanistan Brooksyne and I were discussing what followers of Christ might experience in the moments leading up to their martyrdom. As we played out the tortuous scenario in our mind we wondered how God might bring about peace in a time of terror. In the face of death I believe that a message of triumph is delivered by heavenly messengers directly to the heart of the believer. Its message, whether through Scripture, song, or a revelation from God calms unimaginable fear and triumphs over terror in the heart of a martyr. Of course so much more will be revealed on the other side but we do have some insight from Scripture. Jesus foretold of a time when His followers would be called to suffer and recognized that the natural human inclination would be to worry about this, but Christ indicates there will be a special anointing of the Holy Spirit at that time. "On my account you will be brought before governors and kings as witnesses to them and to the Gentiles. But when they arrest you, do not worry about what to say or how to say it. At that time you will be given what to say, for it will not be you speaking, but the Spirit of your Father speaking through you" (Matthew 10:18-20). Although the Lord in this case does not specify that His followers will have physical suffering or die a martyr's death (although He does elsewhere) the principle of special help from the Holy Spirit given at a time like this surely applies. Stephen, when he faced an avalanche of stones that would lead to his agonizing death, had a special vision of the Lord standing at the Father's right hand. Though his martyrdom was imminent God enabled him to preach one of the best sermons recorded in Scripture, an overview of the work of God from the time of Abraham up to the day of Stephen's stoning. He didn't shirk his convictions or cringe in fear but died with assurance and a forgiving heart toward those who hurled the stones in his direction. I wonder how many stone cold hearts were softened that day and shaped into the image of Christ as a result of Stephen remaining faithful, even to the point of death. Paul was graphically warned by the prophet Agabus of the dangers that awaited him if he would go to Jerusalem. But Paul expressed this wonderful confidence, "I am ready not only to be bound, but also to die in Jerusalem for the Name of the Lord Jesus" (Acts 21:13). The epistle to the Hebrews was written to encourage early believers who were tempted to return to their old way of life. The writer is unidentified but the Holy Spirit is most certainly identifiable as He gives the initial recipients and all of us a good dose of inspiration and spiritual stability. These believers were enduring both persecution and false teachings that sought to undermine their faith. But let us consider this phrase today; "It is good for our hearts to be strengthened by grace." Perhaps you would like to personalize it even further by declaring, "It is good for my heart to be strengthened by grace." The word "strengthened" conveys the sense of being established and stabilized. There is much that is unstable in our world but we are strengthened just by knowing that we are receiving a kingdom that is unshakable. Tom White, director of Voice of the Martyrs asks, "Are we willing to endure rejections, to have our world "all shook up," confessing Him with our mouth? However we proclaim His name, in our joy or in moments of anguish, He is our focus. Jesus wants us to focus on His unshakable, unmovable kingdom no matter what the cost." God's grace is so amazing in a multitude of ways. We primarily and properly consider grace in regard to our salvation, for we are saved by grace. But God's grace strengthens our hearts all through life's journey and we believe there is a special dispensing of that grace during life's hardest moments, certainly for those called to give their all through martydom. Terror threats may distress us; weariness may drag us down; discouragement may set in; friends may forsake us; financial security may crumble and false doctrines abound, but God's grace continues to strengthen the heart! Today, we want to encourage our faithful followers of Christ. Regardless or because of what you are enduring may your heart be strengthened by God's amazing, all-sufficient grace! Daily prayer: Father, Your exceeding grace is evident as far as the eye can see and reaches way beyond my limited imagination. But the greatest aspect of Your grace is that You choose to reside within my heart. 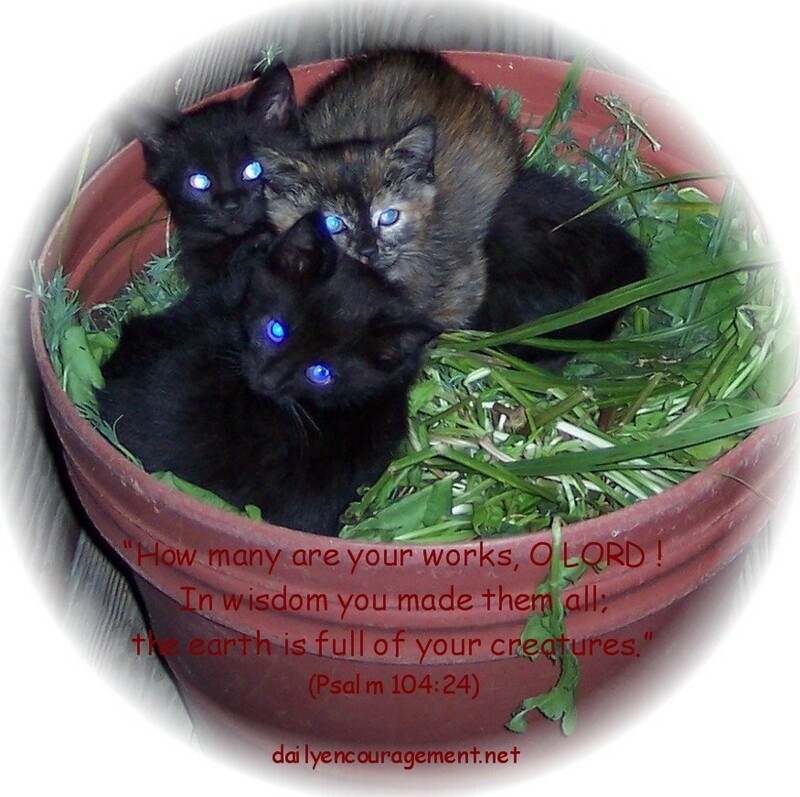 Your abundant grace brings me assurance when the world speaks of trouble. Your abiding grace brings me consolation when others would forsake me. Your sustaining grace is manifested far more in the trials of life than in the mountain top experiences. Thank You for supplying me with Your sufficient grace in the height and depth of my existence. Your amazing grace is supernatural; it never ceases to amaze and it is good for my heart to be strengthened by Your grace! Amen. They're back!!! This morning Roxie endured the kitties climbing up on the glass door peering over her as she ate her breakfast. Since we're not inviting the kitties to make our house their home Brooksyne resisted giving them food (that's hard to do). The neighbors are away and that's probably why Kitty 1 and Kitty 2 decided to also vacation - at the Weber home. Our present visiting kittens remind us of these three kittens who "adopted" us for awhile several years ago. Brooksyne took this photo using flash several years ago when they found a place to lie down in a planter on our deck at night. The three kittens were born to a neighborhood stray and hung around our house for awhile till we found homes for them! 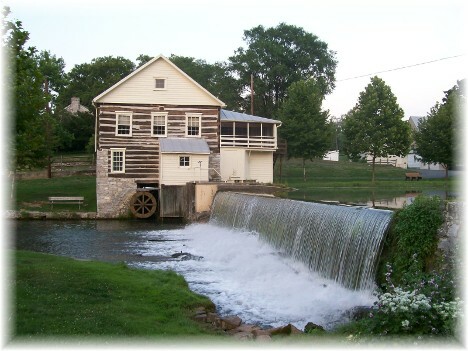 Laughlin Mill: We passed this beautiful old mill and waterfall on our way home from Roxbury Camp last week and stopped to take the featured photo at the top of our post today. Here are some more photos from a genuine mill enthusiast. Scroll down and note the Scripture text at the bottom. This man has prepared webpages for 1388 mills and has over 6,298 photos! Do you know what SPOOM stands for? See here.